See, my Mama has rheumatoid arthritis. She has good days and other days when she doesn’t move far or fast. The idea behind “Hero Food” of preparing and eating foods that can be nourishing and healing, thoughtfully prepared with the intention of flavor and reducing inflammation instantly hooked me. So much so that for Mother’s Day I bought and sent a copy to Mama for her to scribble her own notes in the margins. 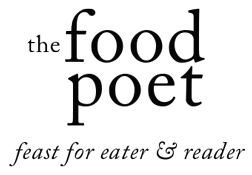 But this is not a cookbook relegated for the health aisle of bookstores, it is chock full of sumptuous recipes like Pan Roast of Arctic Char with Sorrel Sauce. Mullen takes creative license listing out his 10 “hero foods”, foods that he feels bring benefit to his body and living with RA. They also happen to be foods he is passionate about eating anyway. The book is divided into four seasonal sections starting with Winter in Barcelona, moving onto Spring on his Rooftop in New York, then onto Summer on the Farm, and finally Autumn in Vermont. Each of these locales is central to his style of cooking and he is sure to include stories or snippets of how he got inspired to create the recipe in his head notes or in the chapter introductions. His hero foods consist of olive oil, dried beans, almonds, grains, anchovies, sweet peas, parsley, berries, carrots, corn, stone fruit, squash, mushrooms, and greens. Additional chapters on good eggs, good birds, good fish and good meat take a moment to consider the conditions and environmental impact on the food in question. In good birds, he talks a bit about factory egg farms, describing the conditions and then considering how those conditions affect the lives of the birds and in the end, the food that we eat. Being raised in Vermont, Mullen describes his childhood on the farm with his homesteader parents (and butcher mom! ), as well as the difference between a free range chicken hunting for its food and the kind of egg it lays. This upbringing impacts his cooking. The cookbook is dedicated to his grandmother “Mutti” and she makes an appearance in recipes like the Plum Cake (p. 212) or in stories throughout the book. My style of cooking is to take what I like and leave the rest. Since I haven’t eaten pork or any derivatives for almost six months, I did find myself flipping quickly through the Spanish section of the cookbook looking for more veggie-friendly recipes more my speed. And I found them quite easily. We made Mullen’s easy Chilled Carrot Soup with Tarragon and Yogurt (p. 186) on a balmy Saturday evening and found it to be a refreshing side to the Tortilla Espanola (p. 111). 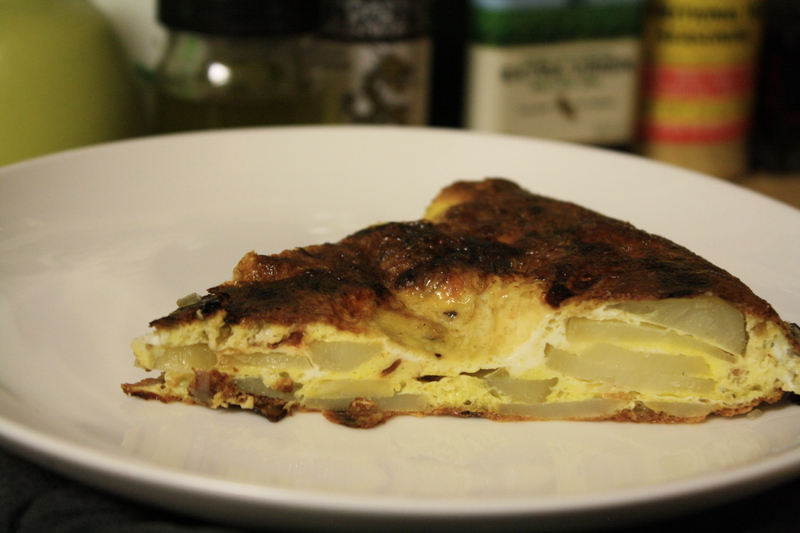 A delectable perk to the Tortilla Espanola resulted in onion and garlic infused olive oil dregs which have tastefully imbued their flavor into weeknight food. What seemed better for a sultry Sunday afternoon than the Sunday Roast Chicken (p. 130)? 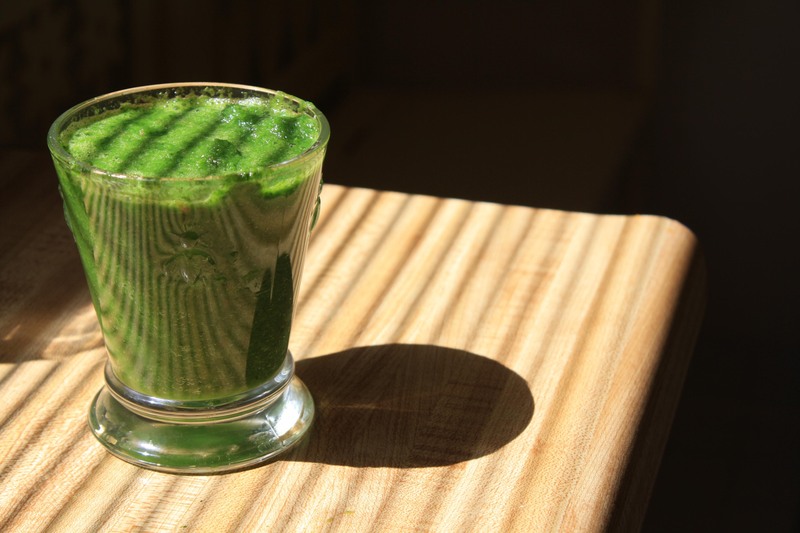 One morning we happily drank Mullens’ well-loved Parsley Juice (p. 155). We found the Salsa Verde (p. 155) an easy sauce that brought a bit of zip as a finishing sauce for roasted fish or drizzled on roasted veggies. His “10 Things to Do with” lists on almonds (p. 58) and corn (p. 193) give clever recipe idea asides also buried in the chapter introductions, which are really superb considerations of multiple uses beyond the recipe for some of his hero food ingredients. Several of the recipes in “Hero Foods” felt familiar. Mama’s housemade salsa reminds me of his recipe for sofrito (p. 65) with essentially the same ingredients and process. 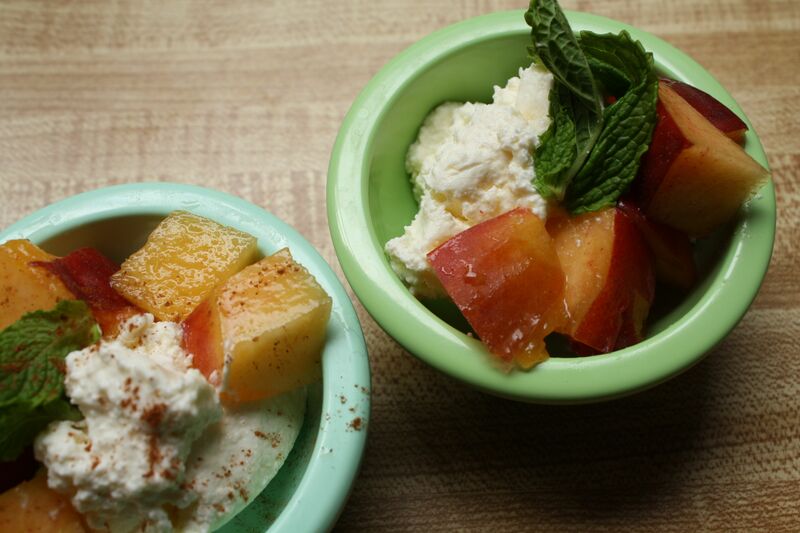 His recipe for White Peaches, Pistachios, Honey and Ricotta (p. 211) reminded me of my own Elberta Peaches with Housemade Ricotta because really what is better than fresh peaches and just strained warm ricotta? Recipes I’m planning on tackling in coming weeks include entrees including Lamb Meatballs in Tomato Sauce with Ricotta (p. 293), Chilled Sweet Pea Soup (p. 147) and Stuffed Spaghetti Squash (p. 254). Some interesting and fun takes on traditional foods include Mullen’s Homemade Lamb Bacon with Kale and an Egg (p. 290) and a refreshing take on Ranch dressing of Kefir Vinaigrette (p. 148). Savory side dishes caught my eye: Cremini Mushrooms al Aijillo (p. 265), Spicy Rapini with Almonds (p. 272) and Chard Croquettes (p. 280). 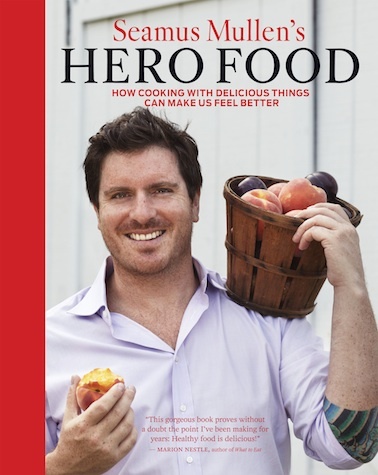 In short, Seamus Mullen has created a cookbook that Marion Nestle recommends on the front cover. “This gorgeous book proves without a doubt the point I’ve been making for years: Healthy food is delicious!” If you are looking for fresh ideas on cooking with seasonal ingredients that also happen to be “hero foods” get your hands on this cookbook. Then again, if you happen to be someone smitten with Spanish cuisine and culture, this is a good book for you. And if you have rheumatoid arthritis, consider that the food you cook and eat might be your heroes too. For a fun Q&A, check out this Q&A on Goop with Chef Seamus Mullen. After reading this, I’m counting the days until peach season as both versions with ricotta sound delightful! I also like the Spanish influence in Seamus’ cooking and recipes and I really want to make the chilled carrot and the pea soups. How about eat the book? Your photos have me sold 😉 Thanks for posting, you have inspired me to pick it up. 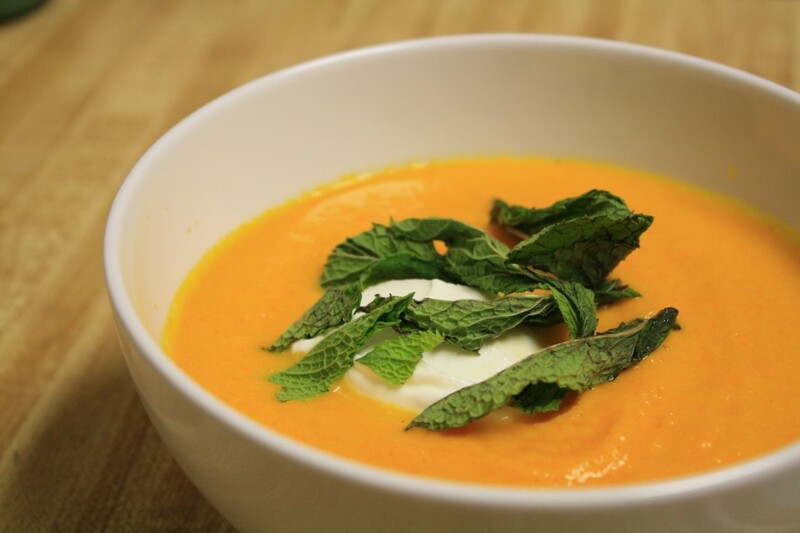 And let it be known that Chilled Carrot Soup was perfect for a sultry summer evening.